Basketball shoes are a big business and they continue to gain traction among mainstream fans. While the spillover to card collecting has not been very evident, shoe cards have been slowly trickling out from manufacturers over the years. 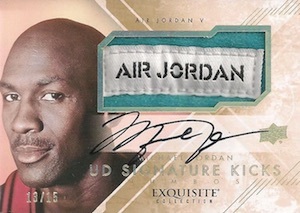 Thanks to Upper Deck, collectors can now see a more expanded look at sneaker cards in 2013-14 Exquisite Basketball. 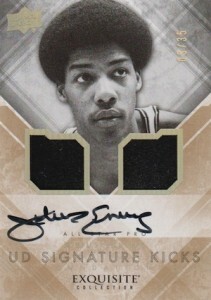 The premium product features a variety of signed sneaker cards from some of the biggest names in the history of basketball. 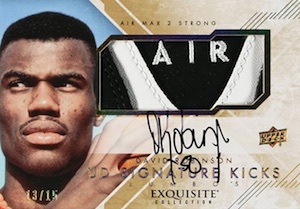 The insert line falls under the UD Signature Kicks banner and includes a variety of basketball shoes from multiple eras, along with an on-card autograph and limited print run. A total of 18 different sneakers were utilized for this set, including two different models for Michael Jordan, LeBron James and Anfernee Hardaway. 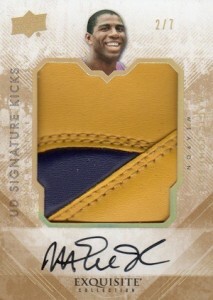 The specific shoe pieces found in the cards for each player can be seen below. They are also noted on the cards themselves. Upper Deck acquired each of the shoes on the secondary market, so while the shoes are authentic releases, they are are not game-worn or event-worn editions for the players in question. 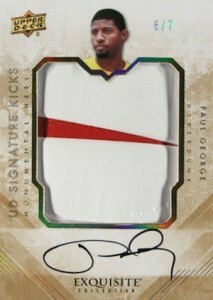 While game-worn versions would certainly have commanded more attention, the direct connection to each player makes for a unique collectible that extends to both basketball card collectors and sneakerheads. And it also gives a more relevant and authentic feel to the card versus a manufactured patch. The full checklist for the set includes only the 18 shoe and player combinations shown above. However, a variety of versions, each highlighting different parts of the shoes, offer increased rarity and options. All six versions and their respective print runs can be seen in the gallery below. 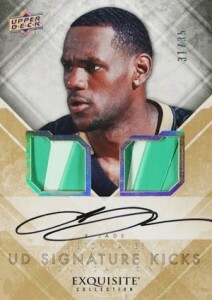 Michael Jordan, LeBron James and Anfernee Hardaway each have two different cards in every subset. 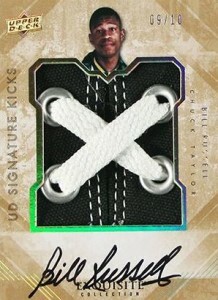 DAVID ROBINSON 13-14 UD Exquisite SIGNATURE KICKS JUMBOS AUTO #08 15! NIKE LOGO! 2013-14 Upper Deck Exquisite Larry Johnson Kicks Autograph Shoe #03 35-Tough! 2013-14 Exquisite Basketball Hobby Box Giannis Antetokoumpo AUTO ? ?